Caterpillar was the first engine manufacturer to earn NR Stage III certification for well stimulation engine in China in October 2015. 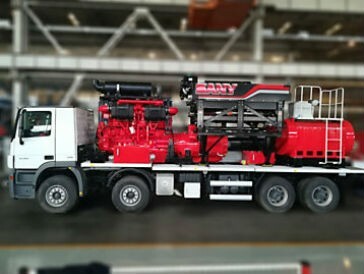 SANY OIL will utilize this power module to produce a 4-axle pressure pumping truck that complies with road limits related to per axle weight and will be operational by 2Q 2018. "Caterpillar has a long history in well stimulation engines and transmissions," said Rodney Harms, well service manager for Caterpillar Oil & Gas. "Our experienced team has a deep understanding of tough pressure pumping operations and customer requirements and the new 3512E was designed with those needs in mind. The engine is based on the U.S. EPA Tier 4 engine platform, with improvements that enable the engine to reliably meet the increased power density and emission standards of China NR Stage III. The transmission leverages decades of transmission design and over 10 years of proven durability on the TH55 to deliver a tailored solution for pressure pumping," said Harms. With China's new road vehicle GB1589/2016 regulation, all new well stimulation trucks must meet the "per axle load" limitation and the maximum height limitation. Caterpillar's launch of this light weight, compact module is targeted to meet these regulations with the highest power density engine transmission package available. By utilizing the Cat power module, customers can continue to use the 4-axle chassis to build the 2500 type pressure pumping trucks without exceeding the axle loads or vehicle height limitations of the new regulation. The 3512E engine combined with the CX48-P3060 transmission deliver an ideal high-density power solution for well stimulation operations at the lightest weight in its class. "Whether operations reside in mountainous areas or desert terrain, this package can accomplish more than the 5-axle truck or other heavy vehicles which are unable to handle the rough terrain," states Harms. With Cat Connect, technology embedded into the equipment, customers can make well-informed and timely equipment management decisions to help control costs, improve operations efficiency, optimize production and reduce downtime and risk.